In my entrepreneurial travels over the last two decades, I have seen that speaking of the future as being reality today is a necessary trait for successful entrepreneurs. One CEO who I worked under told me that he was always able to count on me to “will” our future to happen. Entrepreneurs are able to articulate the possibilities that others may not yet grasp. We think big and speak clearly and consistently. This clarity over the long haul enables us to make the future we speak of a reality. Creating a new category and owning it is a strategy that those of us who like to “speak the future now” often take. Arcimoto, an Oregon based company, means “Future I Drive” – fitting, seeing as how they have believed for over a decade that electric is the future of transportation. 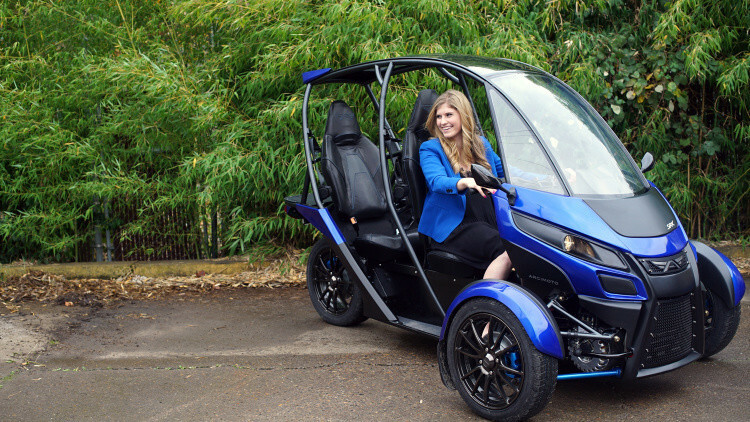 I recently had lunch with the attorney who worked on the IPO for Arcimoto, and he shared with me how Arcimoto added a twist to the SUV category. They created a new category: FUV or “fun utility vehicle.” Combining the highest of electric efficiency vehicles – 230 mpg – into a shape that crosses a go-cart, motorcycle, and golf cart – at a reasonable price of $12,000 – resonated with consumers who appreciated environmental efficiency and fun. When I joined OpenSite Technologies as one of the earliest employees to put together a marketing team, we worked out of a sparse former dental office where the one co-ed bathroom was just a few inches away from the desk of an inside sales rep. A bit too close for comfort, but convenient! As we quickly grew, our work areas became so closely stacked that we were breaking fire code. But we appeared much larger to the outside world. When we briefed leading industry analysts, we spoke of “our future now,” and then “willed” our future to happen. On my first week on the job, I sat in on a call with the leading industry analyst and our valiant co-founder, who spoke of our company and its product line as if they were fully complete. Unbeknownst to the analyst, we were an early stage start-up that had just raised venture funding operating out of a makeshift former dentist’s office in Durham with 30 employees. Certainly, we had the resources to make what he said happen. We just weren’t quite there yet. Given this was in the early stages of the internet and there was some lag time involved between briefings and actual dissemination into reports, and how incredibly fast we were moving, his “speaking the future now” was the right thing to do. Founded just 3 years earlier, eBay was enabling online auctions for consumers to purchase a wide range of products. While they were legitimizing online auctions or “dynamic pricing,” for consumers, we saw a future in the B2B space. We birthed a new category, “dynamic commerce,” a twist on the established category of e-commerce. We powered B2B online auctions for specific verticals like plastics (GE Plastics used our technology to get rid of off spec inventory), retail (Sharper Image determined optimal pricing for their fixed price products using OpenSite) and financial services (PNC Bank auctioned certificates of deposit). We created a new category and owned it. As I built a highly capable marketing and product management team and my colleagues grew their teams, our company of just over two hundred employees put our category onto the mainstage where we dominated as market leader with over 50% share and 600+ customers. Siebel Systems, the fastest growing software company in the world at the time, was making a foray into e-commerce to add to their CRM offerings. They thought it would be good to add a dynamic pricing component to their e-commerce suite. Tom Siebel, co-founder and CEO of the company that bore his name, came to visit our operations in Durham. Boosted by 3 rounds of funding totaling $30 million, we showed off our robust product, sales, and marketing, and he liked what he saw. Thankfully, we had also moved to a more sophisticated office space boasting separate male and female bathrooms away from work areas. We were acquired for $542 million in stock four years after our founding. In 1992, while sitting in my office at Clorox in the bay area, I received a call from a former Bain colleague who was finishing her second year at Harvard Business School. She was debating offers from 2 companies I had worked for, Clorox and General Mills, as well as a small coffee company that she experienced through a field study. Thinking through the magazines she enjoyed reading – Food and Wine – and her free time activity – cultivating her culinary talents, I encouraged her to follow her passion and seriously consider the opportunity with the small coffee company in Seattle. Clorox and General Mills would always be there. She knew that I had taken a step away from Bain to follow my passion for publishing when I moved to NYC to accept an intrapreneurial role at Sports Illustrated. One year later, in another part of the nation, Brett Smith, co-founder and President of Counter Culture Coffee, was working at his summer internship at T. Rowe Price while earning his MBA at UNC Kenan-Flagler. From his Bloomberg terminal came a steady flow of news about this coffee company named Starbucks. His step-sister in Seattle also informed him of this new coffee phenomenon. It was the summer of 1993. When he came back to UNC, he saw a business plan from a local coffee supplier which led him to a meeting with the wholesale manager of Broad Street Roasters in Durham, Fred Houk. Smith didn’t conduct a classic business school analysis, rather, he quickly connected a few compelling dots, and in very short order, Houk and Smith decided to start this new venture together. Smith had keen foresight to know that coffee had the potential to move from a commodity to a premium product. Today, “foodies” the world over all know Counter Culture is synonymous with the highest quality of coffee. Even though the company focuses now on sales in the U.S. and that is where their 13 training centers are physically located, the company has fans around the globe. Over twenty years ago, Smith, discerning that trends that started out west would eventually come east, decided to focus Counter Culture Coffee on selling to higher end restaurants. Now viewed as a wise move, it was a bold decision back then. Smith saw a great opportunity to play. “I used a lot of gut.” His stepfather had always told him “do something you enjoy.” He always wanted to build a great company. And with coffee, he envisioned a good market opportunity. His company’s immense and thoughtful attention to every step of the food chain – from the source, the farmers, to the training at company coffee shop and restaurant level, to servicing of the specialized equipment, no detail is missed. And taking care of suppliers, customers, and employees creates a culture and loyalty that are second to none. It’s an environment that Smith wanted to build from the start. His consistent speaking of the envisioned future has built the link to the very high quality associated with Counter Culture’s brand. One Triangle CEO shared she would only order Counter Culture coffee for her employees. After she moved out of the Triangle to the west coast, she mail ordered Counter Culture Coffee for herself. It’s no wonder that the company’s e-commerce business is fast-growing. And in the last few years, they have established a presence in LA with a hip, educational facility as an addition to their Bay Area training center and roasting facility. Counter Culture Coffee is filling out their national footprint. Reflecting back, Smith credits Starbucks with introducing quality coffee to a bigger audience and dispelling the notion of coffee as a “nickel a cup, refillable.” Over twenty years ago, Smith was able to see a glimpse of the “future, now” in the potential of coffee. It has become a fascinating product, an “affordable pleasure,” and an ingrained part of our culture – across all generations, with young consumers being perhaps the most fervent fans. So the future is strong. ….And by the way, my friend did choose the small coffee company in Seattle – joining the year of Starbuck’s IPO and holding key marketing leadership roles, building the Starbucks brand from just 150 stores into the global company it is today.